Introduction: Telemedicine applications are necessary developments in today’s “stressed” healthcare environment. Remote Presence® applications for tele-rounding and tele-mentoring using the Wireless Local Area Network-WLAN (802.11) portion of the radio-frequency spectrum and the public internet, have been previously reported by our group. 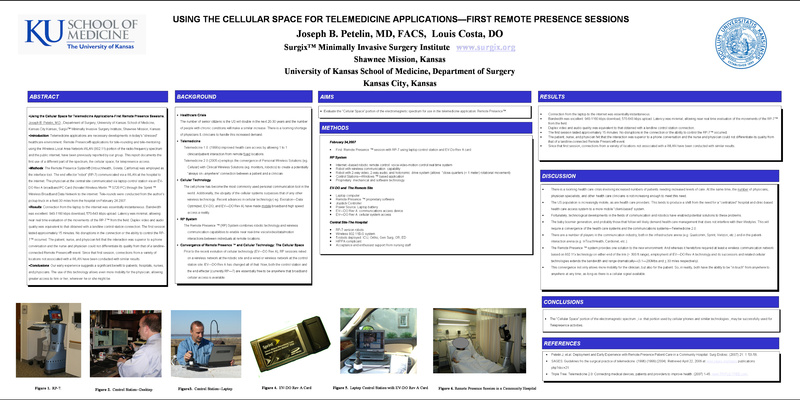 This report documents the first use of a different part of the spectrum, the cellular space, for telepresence access. Methods: The Remote Presence System® (Intouchhealth, Goleta, California) was employed as the interface tool. The end effector “robot” (RP-7) communicated via a WLAN at the hospital to the internet. The physician at the central site communicated via laptop control station via an EV-DO Rev A broadband PC Card (Novatel Wireless Merlin ™ S720 PC) through the Sprint ™ Wireless Broadband Data Network to the internet. The first session,performing tele-rounds, was conducted from the author’s pickup truck in a field 30 miles from the hospital on February 24 2007. Results: Connection from the laptop to the internet was essentially instantaneous. Bandwidth was excellent: 940-1160 kbps download, 570-643 kbps upload. Latency was minimal, allowing near real time evaluation of the movements of the RP-7™ from the field. Duplex video and audio quality was equivalent to that obtained with a landline control station connection. The first session lasted approximately 15 minutes. No disruptions in the connection or the ability to control the RP-7™ occurred. The patient, nurse, and physician felt that the interaction was superior to a phone conversation and the nurse and physician could not differentiate its quality from that of a landline-connected Remote Presence® event. Since that first session, connections from a variety of locations not associated with a WLAN have been conducted with similar results. Conclusions: Our early experience suggests a significant benefit to patients, hospitals, nurses, and physicians. The use of this technology allows even more mobility for the physician, allowing greater access to him or her, wherever he or she might be.